But the main reason that camp has acquired a mailing list is that camp also now has a bug tracker and I wanted somewhere for the ticket change messages to go. Fow now, this is really just a TODO list, with the major missing pieces listed. darcs2camp is currently fiddly to build, as it needs to be linked against some of darcs's sources. In the near future it will either use libdarcs, or I'll fork a copy of darcs and wibble it until it just builds darcs2camp. Due to working on each primitive patch separately, darcs2camp isn't the fastest beast in the world; on the 19766 megapatch (359470 primitive patches) GHC repo it takes me 1 hour 47 mins to convert from darcs to camp format. Then again, the original git conversion took 3 days, so it could be worse! And it shows a patches-converted count to keep you entertained. camp currently doesn't store any meta-data, so it should be a little more than 214M. currently, if we store the primitive patch "name-3" inside the patch "name" then we store the string "name-3" even though we don't have to. We could easily compress individual patches. Presumably if we did this with gzip then we'd get down to about 50M. With a little work we could compress clumps of patches. However, gzipping the whole file only gets us down to 46M, so there is little to be gained there. bzip2ing the whole file gets us down to 38M. And that means we can do timings etc for large repos easily. I haven't looked at optimising get with camp yet, but one thing that should definitely make a big difference is batching up multiple changes to a single file. It is common to get a megapatch which contains a sequence of n patches which change a hunk the same file. When applying such a megapatch, camp currently reads and writes the whole file n times, which obviously isn't optimal! IIRC that made a significant difference when we added it to darcs, and I expect it will for camp too. camp is also cheating slightly, as it doesn't do a syntactic-validity check of the patches it is given before applying them. This means that it'll fail less prettily than it ought to. However, I'm not sure if darcs also cheats, and I don't expect that it will make much difference to the time taken anyway. Camp's space usage while "get"ing is currently higher than it should be because of http://hackage.haskell.org/trac/ghc/ticket/2762 so I can't get good figures for that at the moment. The above is mostly development stuff, mainly due to being at the sprint. I plan to focus more on theory stuff next. As you may have seen on the darcs list, I've started thinking about conflict marking, and I also have some patch theory proofs in my head that I need to get written down in the paper. Cygwin). See the attached ChangeLog for details. Reasons to delay upgrading. Nathan Gray gives feedback as to why his team cannot yet switch to darcs2. Let's fix Nathan's bugs! darcs roadmap proposal. Eric has given us a roadmap for next six months of development. Get hacking! FYI: user-manual status. Trent W. Buck is making steady progress with revamping the user manual. New extension syntax -WError? How do you want to solve this? Managing compiler warnings is now a social requirement instead of a technical one. Buildbot uploads. Don't let the typos scare you away! Jules Colding, Zooko and others have the buildbots setup to upload the binaries as they build them! transitioning to cabal. Darcs now builds with cabal. announcing darcs 2.1.1rc2. Try out our newest release candidate today. growing the darcs team again! Welcome Alexander Suresh Kerr Sittampalam to the world and congratulate Ganesh Sittampalam. new Windows Czar and Review Team. Salavtore has taken the title of Windows Czar and we have an official review team now. Join today! Software Freedom Conservancy agreement. The Darcs project may be joining the Software Freedom Conservancy. [ANNOUNCE] darcs-fast-export. Miklos Vajna has put together a fast export from darcs to git. We had a lot of reviewers this week, I hope I didn't miss anyone. canonize output of sort_coalesceFL in AmendRecord. don't call gzwrite with zero length. define HAVE_SIGNALS in franchise build. Sad news and steady changes. David will be stepping down from leadership of the darcs project, with Eric taking over in these new roles. Standard darcs benchmarks. Let's get serious about numbers. Haskell talk at Columbia Area Linux Users Group. Andrew Robbins talks about "How the Haskell programming language promotes bug-free software.by enforcing heavy restrictions on source code, and on several open source software projects that use Haskell for this purpose (darcs, parsec, xmonad, yi)." How does conflict marking work? Ian peers into the heart of conflict marking. New camp trac and mailing list! darcsweb-1.1 released! With darcs 2 support, bugfixes and syntactic highlighting. Congratulations, Alberto! Official darcs blog. For announcements, darcs weekly news, and links to posts about darcs. Planet darcs to be announced shortly. fix character echo on win32. bracket file writing to prevent windows permission errors. So how did that darcs hacking sprint go? Well, we had a lot of fun and we got a lot of work done, so I think we can safely say that it was a great success! What next? The sprint participants found themselves with a lot of good work started that we simply couldn't put down, so we have continued hacking into the week, turning many of our good starts into more concrete progress. There is still a lot of work to do so we want to make sure we keep that momentum going! The big challenge right now is to get all of the patches reviewed and merged back into darcs.net. Unfortunately, this is creating a delay in the usual patch review process as we clear our backlog. In the meantime, please continue sending your patches! 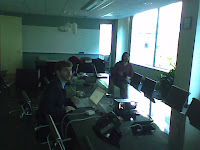 The next sprint will be held in conjunction with the Haskell Hackathon, March 2009 in Utrecht, Netherlands. So see you in six months! newline endings on Windows for HTTP module. http://bugs.darcs.net/issue774 - fix character echo on win32. http://bugs.darcs.net/issue1023 - bracket file writing to prevent windows permission errors. http://bugs.darcs.net/issue784 - fix file handle leak and check for exceptions on process running. developed "chunky" hunk representation and tests! This is the official new announcements blog for the darcs advanced revision control system. We will be posting Darcs Weekly News entries here along with release announcements, hacking sprint details and other community news. Darcs hacking sprint in 2 days! First impressions of darcs. A Pythonista named Benjamin tries darcs out for the first time. Here are his likes and dislikes. Choosing a revision control system. Daniel Carrera compares darcs with Monotone, Mercurial and Bazaar. Daniel finds our "brilliant patch management" to be unique, but what can we learn from the others? fix file handle leak and check for exceptions on process running. Improving the darcs build system? David Roundy is doing some interesting work on building darcs with his franchise build system. There are also attempts by other folks to Cabalise darcs. Discussions are underway about the future of building darcs. Type Correct Changes: A Safe Approach to Version Control Implementation. Jason Dagit gave a Galois tech talk on the use of Haskell GADTs to make darcs code more transparent, robust and approachable. Haskell, static typing, type witnesses and darcs. David Roundy gave a darcs talk at the ACM (5 October), presenting darcs and also explaining how the type witnesses are helping us to avoid errors in the code. Darcs hacking sprint only 9 days away! ignore setCooked and setEcho errors. check if default options are valid. make special cases handle no arguments gracefully. Third pre-release of darcs 2.1.0. Release pushed back to 17 October latest for more testing. We're getting very close to the finish line! Darcs ideas in other VCS. Kirill Smelkov has kind words for us on behalf of the NAVY project, which is moving away from darcs. Best of luck to Kirill with whatever revision control system NAVY choose! While we are delighted that "Good ideas behind [darcs] were adopted by youth", we still have a thing or two to show these whippersnappers. Haddock + Hoogle == Javadoc on steroids. Simon Michael has combined haddock and hoogle to give us a lovely darcs code browser. In the meantime, Florent Becker has been adding value to this browser by sending in lots of haddock patches. Many thanks to Simon and Florent! Patch theory update. Ian gives us his latest progress on documenting, prototyping and improving darcs patch theory. "[S]ome proofs are finally starting to appear, albeit rather handwavey for now". Go Ian! don't sever transfer-mode connection on IO error. NB. half-resolved, more to follow! make ioAbsolute work with symbolic links in file paths. recognise but do not generate patch log 'junk'. New issue manager - Thorkil Naur. The darcs team now has an official Issue Manager role. Thorkil will be ensuring that incoming reports are responded to in a timely manner, and that all bugs are eventually moved to a resolved state. add junk to patch identifiers. check for windows filename validity in darcs add/mv. make darcs-2 format the default for new repositories. detect seemingly unrelated repositories when doing push, pull and send. First pre-release of darcs 2.0.3. This version of darcs has some very nice bug fixes on offer. A few more user-friendliness tweaks are planned for the actual release. Third venue confirmed for darcs hacking sprint, 25-26 October. Brighton, Portland and now Paris are all CONFIRMED. Come hack with us! code.haskell.org upgrades to darcs 2! /usr/bin/darcs is now darcs 2.0.2 on this server. No action is needed on the user's part. Retiring GHC 6.4. Nobody seems to be using GHC 6.4 to compile darcs after all, so we shall be dropping support for it. distinguish between NoArg and ReqArg in defaults parser. avoid adding changes to pending in rmpend when possible. fix patchSetToRepository to work with hashed. it seems to be fixed by the fix for issue709. --no-cache option to ignore patch caches. this was fixed in the previous patch. Venues confirmed for the darcs hacking sprint, 25-26 October. Brighton and Portland are CONFIRMED; Paris is likely. Come hack with us! 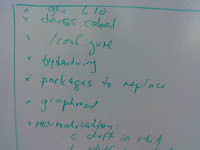 Planning darcs 2.0.3. We have started making steps towards a release for the end of September. Eric thinks we are only a buildbot and couple of bugfixes away from a prerelease. Darcs patch theory. Ian Lynagh continues his patch theory research. He has written up a nice explanation and a working prototype of a darcs-like patch theory. Retiring GHC 6.4. The darcs team would like to know if anybody is still using GHC 6.4 to compile darcs, so that we can focus on later versions (6.6 and 6.8). darcs doesn't guarantee always to compress patches. undo lazy patch bundle scanning. Wrap pwd in cygpath in shell tests. See the darcs weekly news #3 email for the full list. I thought it would be useful if we got back into the habit up summarising our weekly darcs activities. This is the first entry of what I hope to be Darcs Weekly News. We are now planning three sites for the upcoming darcs hacking sprint: Brighton (moved from Cambridge), Paris and Portland. More news as we finalise the venues in the next two weeks! Eric is working on integrating performance regression testing into the darcs buildbot. The progress is slow but steady!